She ran upstairs to cry in her room, then crept up to the loft, where she unlocked the latch, and opened the window onto the roof. She drew in a sharp breath and the cool breeze dried her tears. She put her head against the brick chimney, remembering the young sweep who had been burnt inside. She still hears his screams in the silence of the dark evening. She ran upstairs, then crept up to the loft, where she unlocked the latch and opened the window onto the roof, to play hide and seek. She drew in a sharp breath, pulled her legs out and wrapped her arms around the obsolete chimney, unaware that young sweeps might have got stuck, or even suffocated inside, just a century ago. Instead she looked over the city, twinkling against the rosy evening sky, and smiled as the tiny plane raced across the horizon. 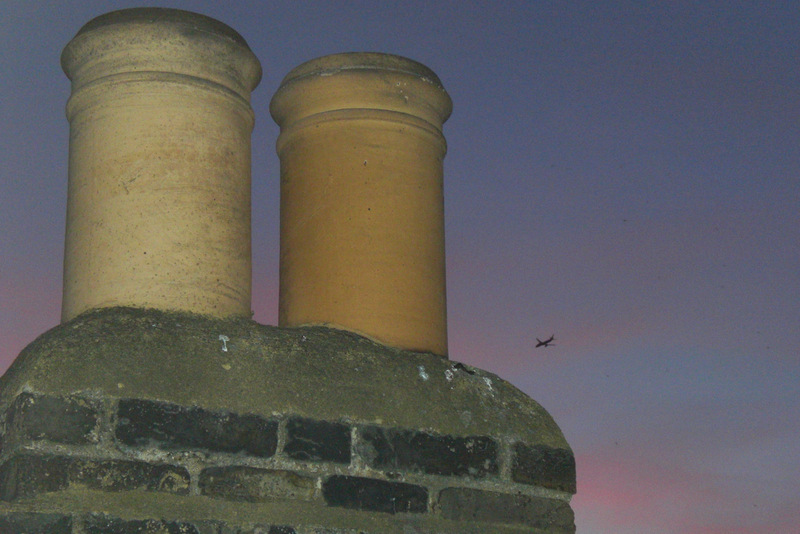 Photo taken from the rooftop window of a Victorian house in south London, last year. http://www.photofriday.com/ Have a look at some other entries! ← Writing 101, Day Four: The Serial Killer. Loss.